West Michigan’s premier sleepover specialist, providing complete sleepover package rentals to your homes, that your little ones will remember for a life time. Choose from a wide range of options and activities to surprise your guest of honor for any occasion. From Birthday parties, to ending the school year, or just because; whatever you can dream of…….we can help you create. We also cater to adult special occasions: “Girls night in”, Under the stars movie /video game nights, Romantic proposal tents, Sweet sixteen, and bachelorette parties. We offer full delivery and set up into your home or venue, however if you are more creative, give our DIY option a try. This option allows you to collect the equipment, create, and return the next day. Each package comes with a tent, air mattress, fitted sheet, blanket, bunting, fairy lights, bed tray, decorative pillows, lantern, and sleepmasks. Little Dreamers Sleepovers are perfect if you are looking for a fun and unique celebration at home. We cant wait to make your special occasion a party no one will forget. Choose from an array of packages. If you don’t see what you are looking for contact us for custom needs. 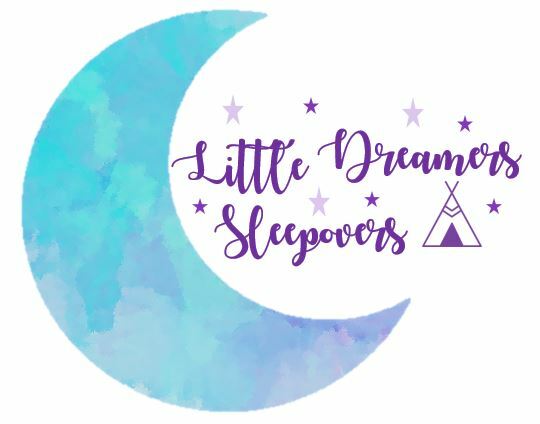 Little Dreamers Sleepovers is such a special way to celebrate a birthday or other special event for girls or boys. We had a sleepover party for my daughter’s 8th birthday and it was so magical and memorable. The tents, sparkly lights and all of the little touches were so wonderful. My daughter was speechless when she first saw it! Maranda has a special gift and was a joy to work with. Thank you!